Gotcha. I wonder how the general mood is in Miyazaki now. Saw there was a little flooding during the tsunami, which is more than we had here. Toilet paper companies are gonna have a hefty profit margin next quarter. Unless they were based in the Sendai area of course. Seriously, man. I think for a lot of people it's probably not the first emergency supply that comes to mind, but rather important regardless. 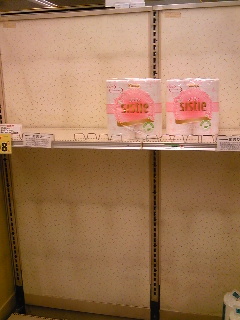 I couldn't belive that toilet paper are sold out.However, it may be inevitable that people become irrational. Thanks for the comment! Yeah, I suppose so. But not to worry - still some left. I remember hearing about this kind of thing going on during the oil shock in the 70s. Maybe Japanese people remember that, or seeing the footage at least, and associate crisis situations with a need to stock up on toilet paper. We still have plenty of toilet paper in Hokuriku though. Thanks for stopping by and commenting, Richard. I'm sure it's not going to get any worse (unless God forbid we get another disaster), but still an eye-opening experience.